A lot of our readers tell me that they are overwhelmed by the number of tipsters available online these days. 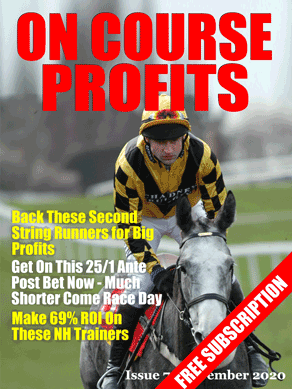 So today we are kicking off a regular hit parade of the top ten tipsters online which is created for us by On Course Profits magazine. Our list of tipsters will be updated weekly to highlight those services which are currently offering a healthy strike rate and demonstrate that they can provide consistent profitability. All tipster results are based on Best Odds Guaranteed prices and results for the last 30days. Sorry are those figures real we ask ourselves? Well on checking it appears so. Three bets and three winners may not seem a prolific number of bets in a ten day period but with an ROI of 110% in the past three months, as the saying goes less is more. Stableline Gold is a horse backing service from Simon Holden which claims to have inside contacts in “every major training centre in the United Kingdom”. The profitability is good, but it does come with a very hefty price tag and as such is possibly not for the everyday punter, and is more suited to the serious large bettors amongst you. Back in November Daily Punt reader Derek shared a system with us for profiting from Nicky Henderson's charges having their first ever start. Today I will update you on the results since we published that system. There have been just 20 bets, so about 5 or 6 per month. There have been 9 winners, which is a whopping 45% strike rate, which is very impressive for any live tested system. Over the last few years I have created a number of different ratings for our own use and clients but these have all be form related. So I guess it was only a matter of time before the question of speed ratings came up. But as with all things racing, it is never quite that simple. Speed of course is related to distance. It is the time it took the horse to run the race divided by the distance that gives us the speed at which the horse travelled.